Driving through Jaipur, one is struck by the sparkling clean roads and neatly intersecting thoroughfares of the Pink City. Digantar, an organisation that works in alternative education for rural children, located outside Jaipur, was the venue for the 9th Partners’ Forum organised by Wipro Applying Thought in Schools (WATIS). Unlike conferences held in air-conditioned auditoria, Digantar offered a white shamiana that was adequate protection against the mild summer heat. Inside, gaddas with white sheets and bolsters promised a sense of being at home – in keeping with the rest of the arrangements. The three-day conference saw some relevant themes in education being discussed and debated by the participants. On the second day, we visited government schools in rural Rajasthan. The participants had a choice to visit schools run by Digantar or the government schools in a sub-district called Phagi, an hour’s drive from the city. The Phagi schools are part of the government’s Shiksha Samarthan Project launched by Digantar in 2006 with support from WATIS. A few of us started early and reached Phagi after an hour’s bumpy ride on the bus. We were accompanied by Pushpajee, a Shiksha Samarthak, whose role is to mobilise support for these schools by working closely with the community and the schools’ staff. After driving through a seemingly endless barren stretch of land, we reached one of the three schools in Nimera, a village in Phagi. We entered the classroom, trying not to interrupt the assembly. There were folk songs, dance and poetry recital. After the assembly, the children of class four were sent to another room while class three stayed with us. The classroom was simple – no benches or desks, only mats. We were asked to introduce ourselves, after which we asked the children for their names. Ninety per cent of the class belonged to the Yadav community. What was most striking was how cheerful and engaged the students were. They came across as bright and confident, and keen to interact with us. 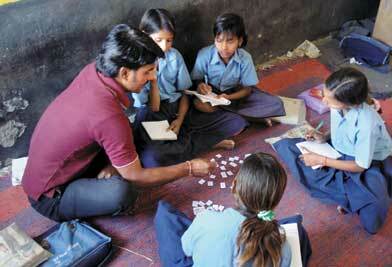 Their learning was different only in terms of school infrastructure. We posed mathematical problems, which they solved with ease. The teacher told us how the education given to them was relevant to their context. For instance, they were taught to measure land in bighas since a number of them took to farming after school. Another revelation was the entirely different way of managing the class without the traditional approach to discipline. If a child didn’t feel like studying – which did happen occasionally – he/she was allowed to do what he/she felt like. Also, students are not failed in examinations, saving them the disappointment and stigma associated with failure that children in most schools are subjected to. to solve a practical problem involving matchsticks. We were stumped and only one of the students, Rekha Yadav, demonstrated it, did we realise how simple the solution was. We left the school with a completely different perception of government schools. The quality of education is not determined by the infrastructure available. Though, with better facilities, these schools could perhaps do much more. Discipline is not necessarily a matter of punishment and reward but rather of understanding what children need without imposing a teacherly view of classroom behaviour. Examinations, beyond grades, are a way of making the student realise his or her best, without encumbering them with the guilt or anxiety associated with failure. We came away feeling that government schools sometimes offer a more practical approach to education, one that is relevant to the socio-cultural context of the child.